"My first idea was that Paul would travel in time to Damascus, Oregon," explained Jerry Thompson, who wrote the script. "He would be totally confused and would be seen as a poor, old homeless man dressed in a dirty robe. A young truck driver would pity him and take him to Eugene." One might expect that a movie with the Apostle Paul as the main character might have such historic Biblical cities as Rome, Italy or Damascus, Syria figuring prominently in the storyline. But that assumes the plot is based in Biblical times. The twist on Thompson's two-hour movie, however, is that it takes place in modern times—the present day. And with Thompson wanting to keep his budget reasonable, he decided it all should be filmed in Oregon. As the movie title implies, Paul is transported or "translated"—as Philip the evangelist was in Acts—in time. "My first idea was that Paul would travel in time to Damascus, Oregon," explained Thompson, who wrote the script. "He would be totally confused and would be seen as a poor, old homeless man dressed in a dirty robe. A young truck driver would pity him and take him to Eugene." So, Thompson drove up to the Portland suburb and scoped out Damascus. "I looked things over and thought, 'This is going to be difficult to shoot, because it's a pretty busy area and would take a lot of expense and red tape to get it done,'" he said. Thompson came home to Cottage Grove and then thought, "Wouldn't it be great if there was a Rome, Oregon?" So, he "googled" it on the computer, and discovered to his amazement that there is a Rome in Oregon. A tiny town of less than 100 residents, it is about 100 miles southwest of Burns and about 30 miles to the Idaho border. "I also thought it would be like God's sense of humor in this fictional tale to translate Paul in time and space from Rome, Italy to Rome, Oregon," said Thompson. 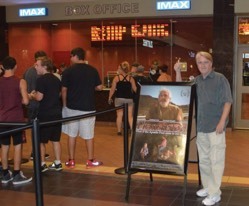 He and his sound and video editor made the seven-hour trip to Rome from Eugene and found it an ideal location for the movie. Other filming took place in Cottage Grove, Springfield and Eugene. The result of Thompson's efforts, according to the Register-Guard newspaper of Eugene, was a "classic 'fish out of water' plot with religious undertones and deep roots in the Eugene area." One of the few independent films produced entirely within Oregon to appear in a national theater chain, the movie had its debut screening several months ago at the Regal Valley Center Cinemas in Eugene. All but one cast member is a native to the state. The lead role of Paul is played by Robert Cohn. Other actors include Anthony Lam as Tim Bennett, Rebekah Stought as Kayla Morgan and Chris Green as Jalen. University of Oregon women's basketball coach Kelly Graves has a small role. The soundtrack features a pair of songs from Eugene native Mat Kearney, including the Oregon sports anthem "Coming Home." Thompson grew up in Cottage Grove and came to faith in Christ while attending the University of Oregon for two years, before earning a degree in pastoral studies from Eugene Bible College, now New Hope Christian College. He also attended CBN University—now Regent University—in Virginia Beach, VA, which helped him find a job with a film company in Medford. Thompson eventually produced Mighty Oregon, a seven-hour look at the history of Oregon Ducks football, and God on Trial, an award-winning Christian film for which he appeared on The 700 Club TV show in 1984. Thompson said that over the years he had become increasingly concerned over the lack of unity within the Christian community today, even among churches of similar perspectives. "Can we say we are really one when we don't meet together, we who were 'chosen to proclaim the wonderful acts of God, who called us out of darkness into His own marvelous light,' and share for the whole family to hear what great things the living God is doing through us and around us?" he asked. Thompson decided a feature-length film could communicate such a message.